Reports that apes have an innate linguistic ability and can be taught to communicate with humans have been questioned by several authorities on primates. The reports say that chimpanzees and other apes at Georgia State University's Language Research Center (LRC), using a computer system attached to a voice synthesiser, have learnt enough words to make simple sentences. The computer is a flat panel with hundreds of touch-sensitive squares, each bearing a symbol or image corresponding to a word in the animal's vocabulary. Touching the square makes the synthesiser produce the appropriate word. One bonobo (pygmy chimpanzee), Kanzi, can use the system to say: "I want a cup of coffee, please". Another, Panbanisha, is said to know around 3,000 words. But Dr Tom Sambrook, of the Scottish Primate Research Group, told BBC television of his doubts that the apes' achievements signified all they appeared to. "They can use language effectively to make requests", he said. "But whether they're understanding what they're doing is a much more difficult mystery to disentangle." Dr Sambrook was asked whether the LRC's work did not at least show that humans and great apes were closer than many people believed. "I personally have no problem with being as close as possible to the chimpanzees. "But if you look at their production of language, you'll find it's vastly different from the manner in which, for example, a child uses language. Dr Sambrook quoted an earlier researcher's verdict: "Were a four-year-old child to use language in the way a chimpanzee uses it, we would consider that child disturbed." Jim Cronin is director of the Monkeyworld ape rescue centre in Dorset. He believes that primates do have a rudimentary language ability, but is concerned the research at LRC does not offer much to the animals themselves. Mr Cronin, speaking on BBC Radio Five Live, said: "What do the chimpanzees or orangutans ever get out of all this?" "I hear about a gorilla who's been raised since 1972 on his own, in isolation, because it would seem that isolation's the key to being taught this. "And I wonder who's barbaric here." 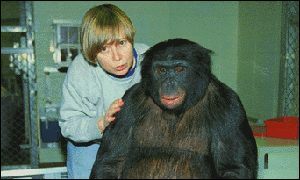 The BBC's Pallab Ghosh: "Many other scientists don't think the chimps are communicating"
Sue Savage-Rumbaugh: "When I hear I am being called, it is very exciting,"